You are talking to a busy girl right now just like you. Who is always in a rush. And was in need of portable hair styling tool. A tool that can sometimes give quick touch-ups and a complete party look too. A tool that is light and easy-to-carry, so i can take that with me. When i was in need of that, the only thing that i was familiar with. That was the mini flat irons. And you know what damage flat irons can cause. But then after digging up into best hair straightening brush guide and research. I found Miuphro mini, a straightening brush that is much convenient. And that i can take with me whenever or wherever i want. Now let me tell you my whole experience with this amazing mini straightening brush. 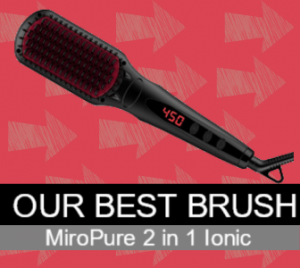 Jumping onto the features of Miuphro mini and what amazing things this mini straightening brush can do. Anti-scald-comb teeth of this brush have a plastic covering. And it adds more safety! The best thing that i live in this hair straightener brush is the lightweight design of it. And the portable size of it with 18cm. Being lightweight, it does not make me tired. And comes with the feature of heating up fast. So, Miuphro mini got heat up within a minute, when i first used it at 210℃. When i want the best results, i section my hair usually. And then i start brushing my hair same like regular but i hold my tips to give brush some resistance. And this way, i get rid of the frizziness more easily and it gives the more perfectly straighten hair. The best design of this brush, it helps Miuphro not to pull or tug my hair. And the power button of Miuphro is not located where you can accidentally click that. And can shut it off! After using it, hair feels healthy of mine. Another thing that i love and provides me ease is. I can even put this mini straightening brush in glove box in my car. It does not take much room and i grab it whenever i need that. So its perfect to use Miuphro mini when my hair is dry. And when i have a bit thinny hair, it works perfectly on them. Now whenever you want something that can help you getting straight hair when you are away from home. 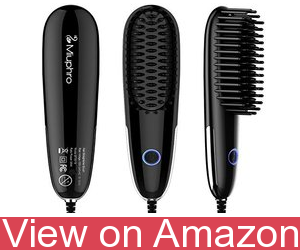 Miuphro Mini hair straightening brush is a perfect tool.